The book follows an alien squid/arthropod creature who meets humans on their planet. The humans are space faring and have crash landed on the alien world. The alien uses weapons like maces to fight the humans. The humans kill the aliens by flipping them onto their backs. Haven't been able to find anything similar except The Damned trilogy by Alan Dean Foster, but I don't think that's the series. 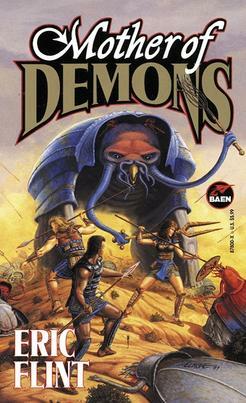 Possibly Mother of Demons by Eric Flint? On arrival at the planet, the human ship is destroyed in an unexplained accident; the only survivors are the ship's children and a few adults, who escaped on two lifeboat shuttles. They find a highly toxic ecology, and nearly starve to death before discovering accidentally that most humans can safely eat partially digested, regurgitated plant materials produced by the Maia, a race of large semi-intelligent herbivores. The first part of the story proper introduces the aliens, the Gukuy, described as molluscs but vaguely similar to land-dwelling walking octopuses. Guo came to a sudden decision. She laid down her mace and shield and re-entered the clearing. Kopporu turned and stared, as she lumbered her way forward. A universe where humans are the only violent species in the universe?